I look at this week like all the comics in the stores are birthday presents for yours truly, and it’s with great excitement that some of my favorite comics are coming out! And while there are some “important” comics coming out like the one’s that Chris will be telling you about as well as other books like Justice League #7 which starts a new storyline featuring the art of Gene Ha (who is awesome) and the SHAZAM back-up story, those won’t really be making it onto my portion. You know why? Because it’s the Wednesday before my birthday, SUCKAS! 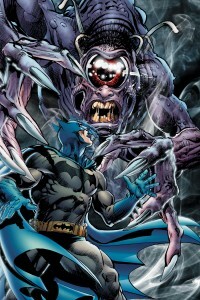 Batman Odyssey Vol. 2 #6 (DC Comics – $3.99): I’m just going to go ahead and say it right here for everyone to know about, Batman: Odyssey is the greatest comic book of all time! I might be over-exaggerating, or “hyperbolizing” for the well-read out there, but seriously I think I love this comic as much as I’ve loved any other comic out there. It’s not for standard reasons, mind you, but I don’t think Neal Adams is going for standard here. Honestly, I’m not sure what he’s going for here, but when you have 13 issues of a comic that features a good chunk of that story with Batman, Robin and Deadman teaming up with pre-historic versions of Batman and Robin (WHO IS AN EVOLVED DINOSAUR!!!!) in the center of the Earth where all of them ride gigantic bats and dinosaurs, you’ve pretty much guaranteed that I’ll be buying and worshipping every single issue of the series. Of course, it doesn’t hurt that I’m taking the comic with a grain of salt. If you have any concerns with minor circumstances that deal with “staying in character” or “continuity” then you might not want to read Batman: Odyssey, but if you can let go of all that fanboy hoo-hah, then you’ll probably get a kick out of this book. Especially if you pretend that Neal Adams himself is playing the part of The Caped Crusader like I do. Infinite Vacation (Image Comics – $3.50): It’s the penultimate issue of this crazy as Hell mini-series! I got mad at Henchman21 last night when he told me he wasn’t reading this in single issues, and while I guess I understand his point that there have only been four issues in just over a year, it just shocked me that someone was depriving themselves of this comic when it comes out. It’s such a fantastic book that, unlike my experience with Nemesis, I absolutely don’t mind the wait because it’s worth it. Whatever it is that Nick Spencer and Christian Ward are doing to make this comic read and look the way it does that keeps it on a delay, please keep doing it because this book gets better and better with each issue. Infinite Vacation is truly revolutionary in the comics medium. It’s a story about a multi-verse and science acceptance that if there is a multi-verse, there must be at least one universe where there is only a sole universe. I know that’s confusing, but if you’ve stayed up as many nights as I have theorizing on different possibilities in life, it makes perfect sense. Let’s put it this way, if there is a multiversal structure where any and all possibilities are existent, then that would mean in of those universes, there’s a structure of a creator and one universe. It’s a paradox within the universe, and it causes all thought to crumble. Whatever, if you don’t get what I’m talking about read this comic, because it deals with all of this. I’m glad I’ve found kindred spirits of crazy with Spencer and Ward. I can’t wait to see what this and the last issue do with my brain. Dark Horse Presents #10 (Dark Horse – $7.99): I have a hard time considering this a single issue book because, well, it’s an anthology book. It has a whole lot of different creators contributing several different kinds of stories and it’s too expensive to put next to books that are going for $2.99. But if you’re looking for the best bang for your buck as the old deer hunters would say in nineteen aught five, you should absolutely pick up this book. I’ve said before that Dark Horse Presents would be the only comic I was buying if I was only buying one comic because of the quality and variety in each issue. But what makes this installment special? Well, we see another installment of Steve Niles’ Criminal Macabre story, as well as the finale to the amazing Brian Wood’s The Massive, but the main reason that I’m suggesting this is the mighty return of Evan Dorkin’s House of Fun, which if I’m not mistaken means that Milk and Cheese will be along for the ride. This issue is bound to remind you why you love comics. Diversity, originality, humor, intrigue, all of these are available within the pages of Dark Horse Presents. Animal Man, Book 3: Deus Ex Machina (Vertigo Comics – $19.99): Here’s the thing, a lot of legendary comic book runs happened before I was of age to appreciate them the way I should have. So, I flat out missed out on books like Swamp Thing by Alan Moore, Sandman by Neil Gaiman, Animal Man by Grant Morrison, and many others. Don’t hate, it’s just a matter of comic shops closing and being ten years old in 1993, it just wasn’t going to happen, and more than that, I wouldn’t have been able to appreciate them. Honestly, if you’re able to appreciate the intricacies of a vegan super hero, the definitions of reality, and what The Coyote Gospel actually means at that age, you’ve got to be kidding yourself. Anyway, I’ve recently been working on this problem of mine by going back and getting the collections of these and more comics, and with the case of Morrison’s Animal Man, I’ve got two of the three collections and now it’s my birthday. The first two volumes are still absolutely mind-blowing to me as a reader in 2012, so I can only imagine what they would have seemed like when they first came out. This comic is clearly an important entry into the industries vast collection of stories, and it’s easily become one of my go-to’s to show what comics can do and what superheroes can actually mean off the page. I love this book, and if you would help me complete my trade collection, I’d love you too. So, what do you think? Also, Henchman21 thinks you should buy me this because he says it’s good and I’d also like to check out Hickman’s soon-to-be-finished Fantastic Four run. 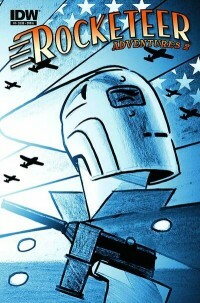 Rocketeer Adventures 2 #1 (IDW Publishing – $3.99): The first Rocketeer Adventures miniseries was one of the best books of last year and I have high hopes for the second volume. The series takes some of the best creators in comics and lets them loose on Dave Steven’s classic character. This issue features stories written by Marc Guggenheim and Peter David, with art by Bill Sienkiewicz, Sandy Plunkett, with another story written and drawn by Stan Sakai, and a sure to be awesome pin-up by Arthur Adams. That is a lot of top flight talent right there. The Rocketeer is one of those characters that is beloved by comic creators, and they seem to love adding to Dave Steven’s legacy. I promise you, you will enjoy this comic. Dominique Laveau Voodoo Child #1 (Vertigo Comics – $2.99): We’ve already seen two new series launch from Vertigo this month already, and they have been very good so far, but I was expecting to enjoy those new series. Now we’re getting into the books that I’m not as sure about, but I sure am hopeful about this one. Dominique Laveau comes to us from writer Selwyn Seyfu Hinds, with art by Denys Cowan. It’s a classic story of a young person learning they are the heir to vast power and an even vaster mystery involving monsters, murder, and the macabre. Cowan’s art is the big draw for me here as I have loved his past work on The Question and many other books. Cowan is an old pro, and he may need to carry the book, as this looks to be the first series from Hinds. Hinds has a long resume in projects outside of comics, but it’s always a crap shoot when a writer comes over to the comics world. I’ll give this one a shot, but it’ll be on a short leash. Rebel Blood #1 (Image Comics – $3.50): I’m buying this pretty much exclusively for the art by Riley Rossmo (Proof, Cowboy Ninja Viking). Rossmo is one of the most unique artists working today and I’ll check out anything he is working on. His style seems perfectly suited for this story of a disease that has turned everything into a zombie. Sure, it sounds like a story that we’ve seen before, but who cares? If the story is told well, and if the art is as good as it should be, I’ll still want to read it. Be sure you don’t miss out on this one. B.P.R.D. Plague of Frogs Vol. 3 HC (Dark Horse – $34.99): I’m still sad that we’re not seeing the complete B.P.R.D. saga get the Library edition treatment that Hellboy is getting, but I’ll take what I can get. Vol. 3 picks up the story of the Bureau’s fight against an army of demonic frogs and since I haven’t read these stories before, I can’t wait to find out what happens next. Mike Mignola and John Arcudi have taken a large cast of characters and given them each their own moment in the sun. Each character is well rounded and interesting and you really care about everything that happens to them. And then there’s the art by Guy Davis. When Davis took over on the art for the B.P.R.D. mini-series, he took the book to a whole other level. Davis makes the characters work on the page and conveys the horror and action with equal skill. B.P.R.D. is not just a spin-off, it is just a great book. Find these hardcovers and buy them as soon as you can.